Riding a bike is respecting the other! Kindergarden pupils, with the help of Officers Ferreira and Aparício, worked with Pedro, a pre universitary student from aa local secondary school in a project related to monuments and citizenship. They built models of monuments and made a city with those monuments insid our school. 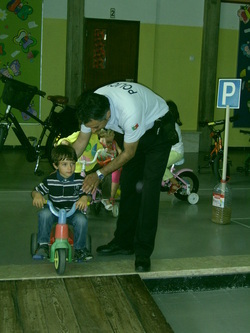 Police helped kids to ride their bikes according to traffic rules, which is a citizenship capability. CITIZENSHIP ON THE ROAD from Comenius Project on Vimeo.